Acting Attorney General Matthew Whitaker is going to show up and publicly testify today before the Democratic-controlled House Judiciary Committee after all. We know this is going to be good, because human sweat depository Matthew Whitaker has already revealed that he’s about to get destroyed for all to see. Scam toilet guy Matthew Whitaker couldn’t be in any more over his head was already under FBI investigation for his past antics before Donald Trump illegally appointed him for the purpose of illegally obstructing justice. He’s also clearly demonstrated that he’s an idiot who can’t keep his mouth shut and blurts out things under pressure that he wasn’t supposed to reveal. 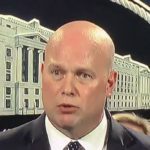 Low IQ Matthew Whitaker is so bad at this, he recently defeated himself in a press conference without anyone’s help. Now he’s about to face tough questions from the likes of Chairman Jerry Nadler, former military prosecutor Ted Lieu, former Deputy District Attorney Eric Swalwell, and former law professor Jamie Raskin. These people all know exactly how to carve up a week witness, and Whitaker may be the weakest witness to ever testify publicly before Congress. So yeah, get your popcorn ready. Root for Matthew Whitaker to implode in front of a live national television audience. He’s a con artist doing the bidding of a traitor, so he deserves whatever goes wrong for him today. But even if Whitaker doesn’t slip up and blurt out Donald Trump’s dirtiest secrets, the key here is that this process is going to scare the living crap out of him – which is the whole point, so he thinks twice about trying to mess with Robert Mueller.